Unfortunately I missed seeing last month’s Blood Wolf Moon (darn you, cloud coverage!) 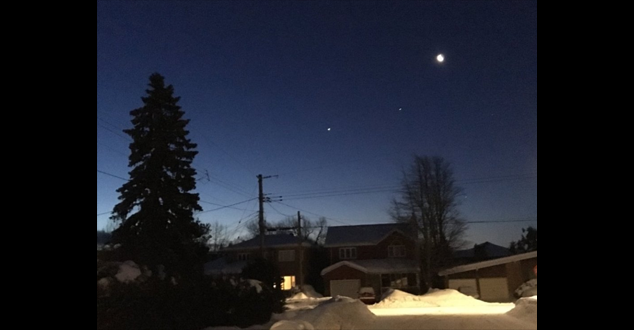 but I did capture this early morning view of Venus, Jupiter, and the moon in alignment on January 30th. Not bad for a quick snapshot from my iPhone if I do say so myself! I hope everybody who lives in a location hit by this week’s polar vortex has finally begun to warm up. Having grown up in Ottawa, Canada, I’ve lived through some pretty brutal winters but the thought of -70F with windchill makes even *my* blood run cold! Filed under Even the Bitter Cold Has Its Own Beauty: This video of boiling water freezing in mid-air is insane… and gorgeous! Hopefully there won’t be any more of these uber-freezing days this year but even a normal winter day is unbearable for many. If it’s January, it’s time for the Consumer Electronics Show, showcasing cutting-edge technology. Here are some of the highlights from CES 2019. If it’s a day with a y, it’s another privacy breach. The biggie this month was a bug when using Apple FaceTime for group chats. Turns out, even if the person you’re calling didn’t answer, you could still hear things through their phone. Good times! I’m not a football fan but I do enjoy the ads. However, if you’re more interested in the game, this article has all the info you need to find it this Sunday. And don’t forget the Puppy Bowl and Kitten Bowl! One of my mantras when it comes to tech products is “Know your Menus and Settings are your Friends,” which I normally think of when I’m learning about new devices and software. But an equally valuable addendum to that is to occasionally review all your menus and settings to find new features that you might not have learned about otherwise and update settings to your current preferences. I was doing this recently with my Android phone and discovered a feature called “Wi-Fi Calling” that I hadn’t been aware of before. What this feature does is let you make normal phone calls using a Wi-Fi connection instead of your normal cellphone service, which is especially helpful if you’re somewhere without a good cell signal or you’re near the end of your monthly allotment of calls. The feature isn’t available on all Android phones and is dependent on whether your phone provider supports it, so you may have to check various menu items to see if you have this option. On my Samsung Galaxy S5 with Verizon Wireless in the U.S. it’s under Settings > Advanced Calling and on my Samsung A5 with Freedom Mobile in Canada it’s in the Settings for the actual Phone app. Filed Under: Apple, Bug Alert, Cutting the Cable Cord, How To, iPhone, Mobile Devices, Monthly Update, Phones, Streaming Media, User Interface Tagged With: "ces 2019" "super bowl"